High school and yeshiva students issue letter to PM Netanyahu and Bennett demanding full ban of public transportation on Shabbat. High school, yeshiva, and seminary students have joined together to call on Prime Minister Binyamin Netanyahu and Economy Minister Naftali Bennett to disallow any type of public transportation on Shabbat (the Sabbath; Saturday). In a letter sent to the two politicians, the students argued that public transportation on Shabbat "does not represent the true spirit of Israel." The controversy erupted anew in October when daylight savings went into effect, and most most bus companies did not change their schedules, leading to many routes' last buses arriving at their final destination after the start of Shabbat on Friday. 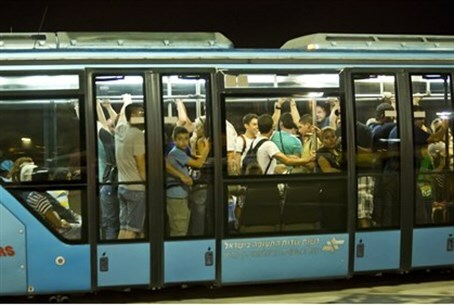 Transportation Minister Yisrael Katz (Likud) decided recently to enforce the laws forbidding public buses from operation on Shabbat, sparking anger Tuesday, particularly from liberal and secular politicians Yair Lapid (Yesh Atid) and Zehava Gal-On (Meretz). Both Lapid and Gal-On noted that those who will suffer from the enforcement of the law are IDF soldiers traveling home from their distant bases for the weekend. However, for the students, this is not enough of a reason to abandon Jewish law. "We did not wait 2,000 years for the Land of Israel to establish a secular state, like all the other nations who forget their roots," the students declared in the letter, adding, "we demand that the religious aspect of Zionism not be considered folklore, covered in dust, rather an elemental part." "There must be an understanding that a key part of Zionism is the Torah, which will strengthen our hold on our country, and will allow us to stand firm against the pressures of Arab countries and the West, and the pressures from inside to hand over our territory to foreigners." The letter continues stating that "denying the values of the Torah will harm the entire nation - its hopes, its aspirations, and its ideas." "These attempts [to do so], supported and financially sponsored by European countries, are designed to weaken us as a people and to undermine the social fabric of Israel." The letter also criticized supporters of public transportation on Shabbat as "detached from reality" for thinking they can create a "sterile public transportation system that has no connection with Jews or Jewish transit authorities." "The owners of the company are Jewish, there are Jewish drivers, and not just that: public transportation requires inspectors, controllers, data center workers, customer service, attendants, mechanics and other related officials [who would be forced to break Shabbat]." According to the students, governmental services being provided on Shabbat, including public transportation, is nothing short of a disaster.